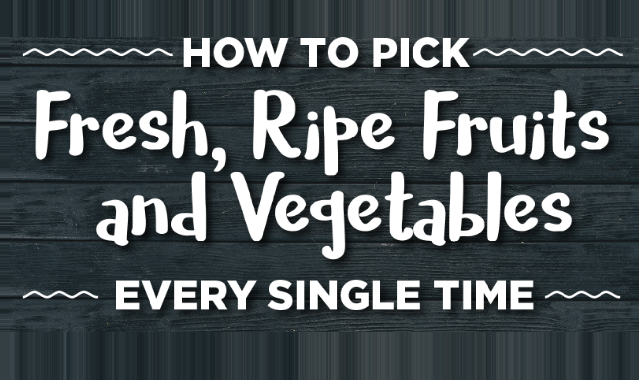 How To Pick Fresh, Ripe Fruits And Vegetables Every Single Time #infographic ~ Visualistan '+g+"
It’s always the same, a couple of hours after you get home from the shops you decide it’s time to eat that avocado. But it’s not ‘ripe and ready to eat’ as the packaging claims, it’s rock solid. Then you ruin it just trying to cut the thing. So, you reach for the mango instead. Most of us know the feeling of buying fruits or vegetables only to find out that they’re either already spoiled on the inside or so under-ripe that they need to be left out for days before eating. If only there were a way to know, in the shop, which fruit and veg is ready to go, and which pieces are going to be too stubborn or too mushy to eat.